died Dec. 21, 1848, age 83 yrs. 13 da. The term RELICT is used to indicate widow (or widower) and I seldom see it twice on one gravestone. But, as I am researching this family, I realized that I have seen this "double widow" on another gravestone of a Gallup family member in a different cemetery. Anna SMITH, daughter of Nehemiah SMITH and Abigail AVERY outlived both of her husbands and is buried next to her first husband, Isaac GALLUP, Esq. with the same style gravestone of urn and weeping willow as his. Anna's first husband was Isaac GALLUP, Esq. They had ten children. 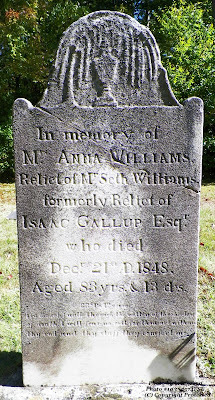 After Isaac passed away in 1814, Anna married again, in 1825, to Seth WILLIAMS (1761-1843), which is why this gravestone lists her as Anna WILLIAMS. Because he is not a Gallup, he is only mentioned as Anna's second husband. 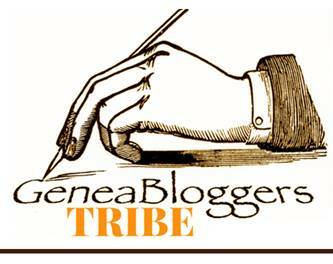 Remember this cemetery I am researching is for Gallup family members, their spouses and descendants. For Seth's information, I had to turn, once again, to the History of Stonington to research him. There were two Williams families in the Stonington area. Seth (#39, page 684) was of the William Williams family, but Seth's first wife was Abigail Williams (#457, p. 680) of the Robert Williams family. Abigail died in 1819. The 1800 census for Groton, CT lists Seth Williams and on the next line his father William Williams. Abigail's parents were cousins and both named Williams!